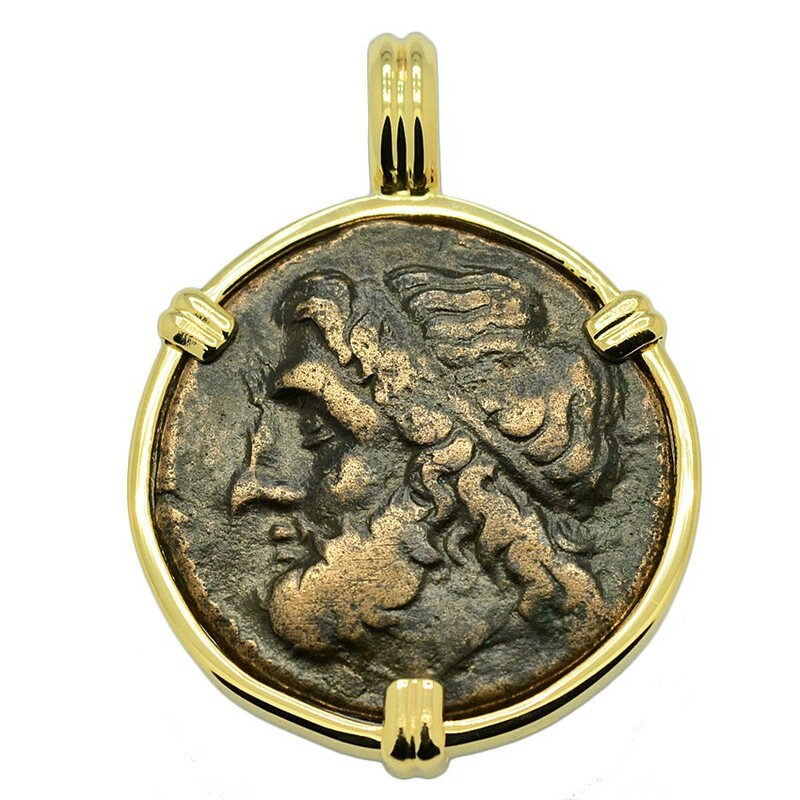 SOLD Poseidon Tetras Pendant; Please Explore Our Greek Pendants For Similar Items. 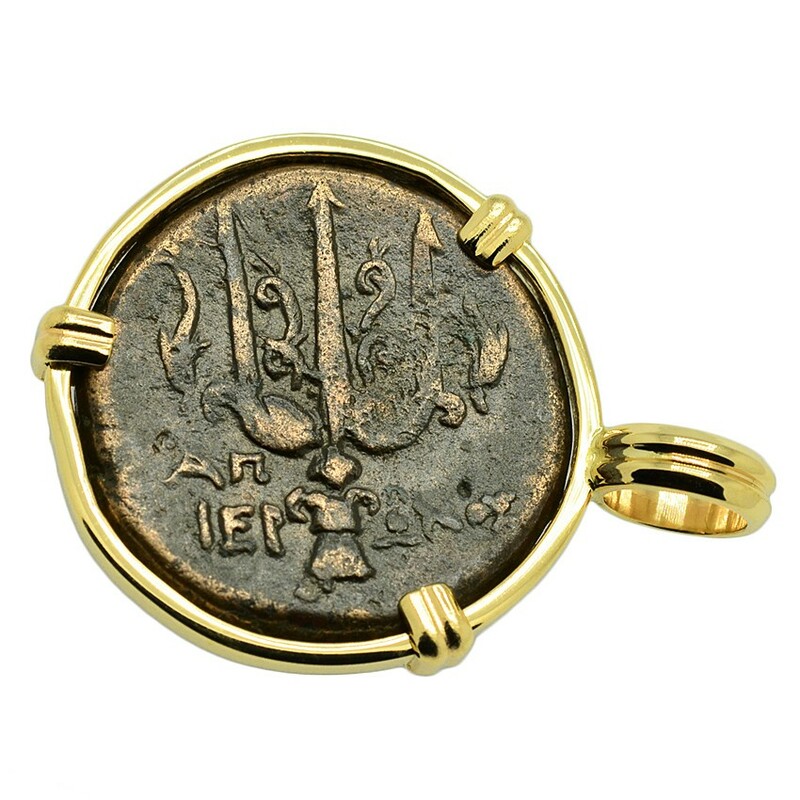 This ancient coin was minted in the Greek city of Syracuse during the rule of King Hieron II. Syracuse was founded along the southeast coast of Sicily in 734 BC by Greek settlers from Corinth and the city soon flourished. Hieron II seized power in 275 BC and inaugurated a period of 50 years of peace and prosperity. During this time, Syracuse became one of the most renowned capitals of Antiquity. Under his rule lived the most famous Syracusan, the mathematician and natural philosopher Archimedes. Hieron became an ally of Rome and frequently assisted them with men and provisions during the Punic War. This coin features the head of Poseidon wearing a tainia. In Greek mythology, Poseidon was the God of the sea and storms as well as the "Earth-Shaker" of earthquakes. Known as Neptune by the Romans, he was a major Olympian God and the brother of Zeus and Hades. 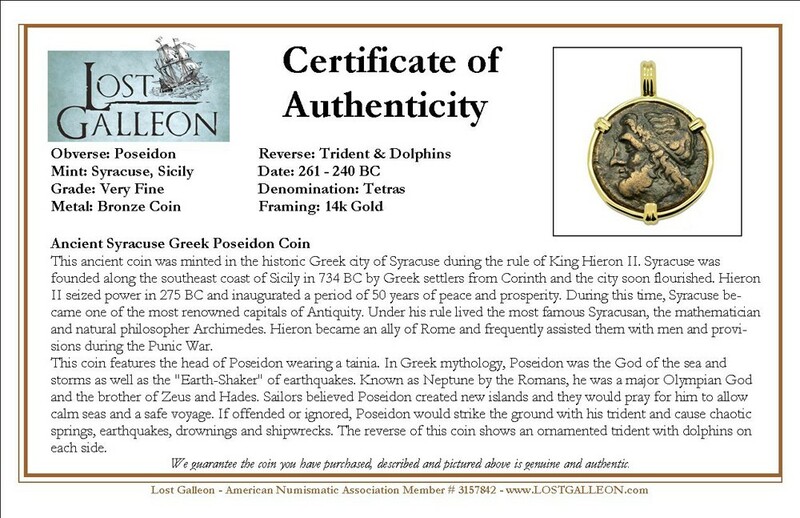 Sailors believed Poseidon created new islands and they would pray for him to allow calm seas and a safe voyage. If offended or ignored, Poseidon would strike the ground with his trident and cause chaotic springs, earthquakes, drownings and shipwrecks. The reverse of this coin shows an ornamented trident with dolphins on each side.